When it comes to public representation of your organization’s image, there are no unimportant details. And even if there were some, legal disclaimers and disclosure statements you choose to include in outgoing messages would still deserve the closest attention. In brief, legal disclaimers and disclosure statements are wordings that express your company’s obligations and guarantees – or absence of such. In a more general sense, these collocations can also refer to any information which companies include in message signatures, and their unified formatting is arguably just as important as verified and approved content. 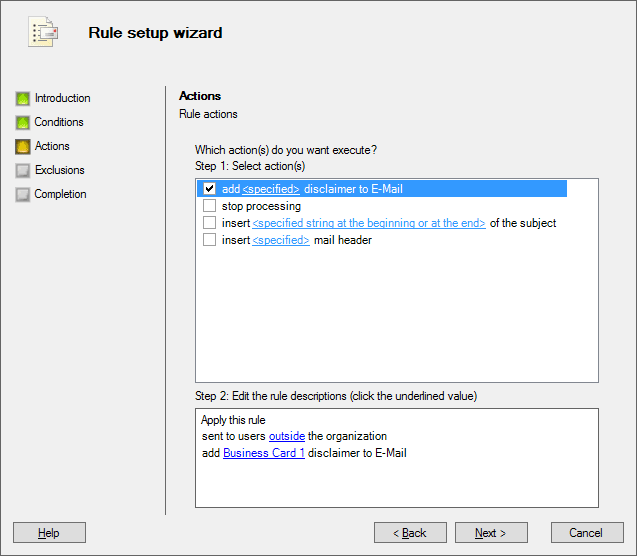 To ensure proper control over outgoing email signatures, we need to delegate this task to the Exchange server instead of individual email clients. 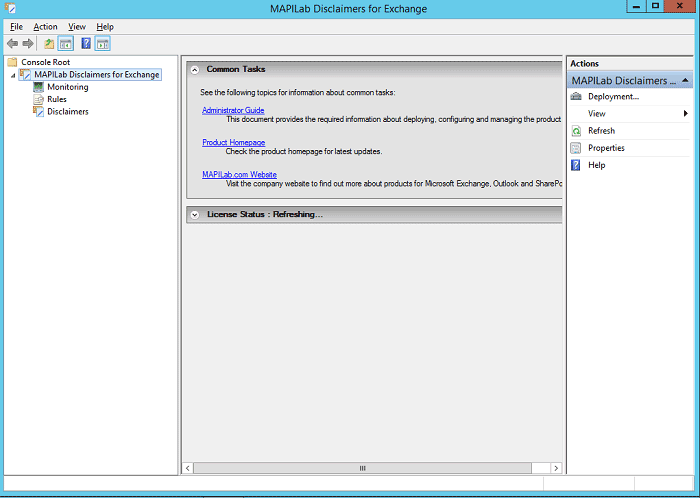 However, adding disclaimers straight on the Exchange server has another perspective, which is a bit more complicated. In most cases inserting a standard disclaimer into each outgoing message regardless of its sender, recipient, and content is not sufficient. In fact, most organizations and IT professionals admit that built-in Exchange disclaimer capabilities do not cover their needs in full. The good news is that Microsoft Exchange platform has a bright positive aspect embodied in its extensive compatibility with additional disclaimer solutions, including third-party tools. In this article we will dwell upon the advantages of a solution called MAPILab Disclaimers for Exchange and give an overview of its useful features as compared to basic Exchange functionality. 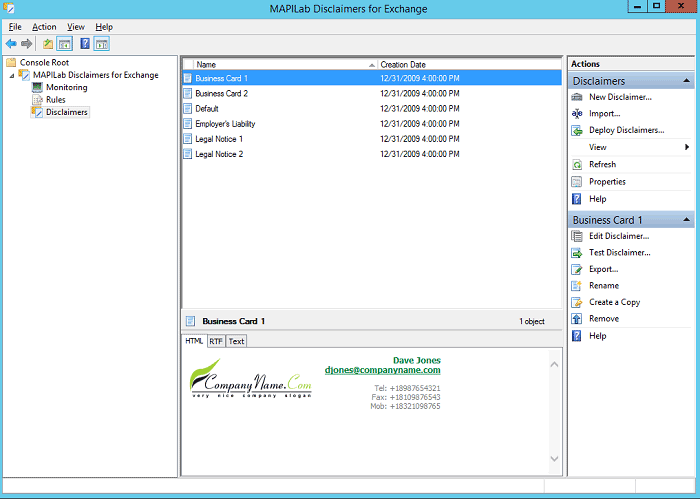 First and foremost, Disclaimers for Exchange includes a full-fledged advanced template editor which supports not only HTML markup, but plain text and RTF formatting as well. In comparison, basic Exchange feature set supports only HTML. In addition, you can preview the disclaimer by choosing a special mode in the editor wizard. 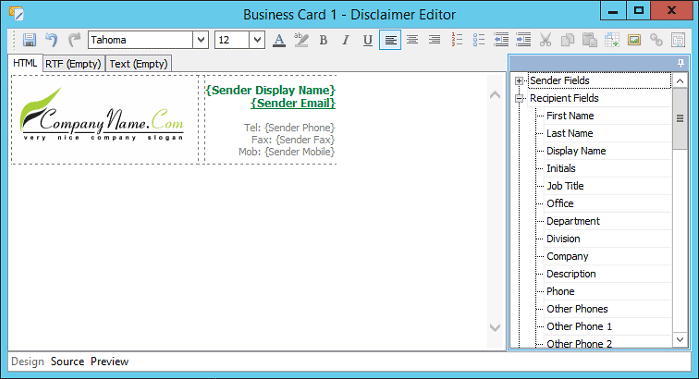 The product also offers extended macro capabilities: use specialized options for senders, recipients, and send-on-behalf users, or create a custom macros in some templates. What is more, you can enhance your disclaimer by adding static images, for instance, corporate logos and banners, or even an employee’s photo automatically pasted from Active Directory. You need not worry if your disclaimer is quite large, as the function of automatic disclaimer deletion will ensure that the disclaimer is displayed only once in a conversation. Second, the solution boasts a practical and no-nonsense approach to templates: any of the previously saved templates can be used as a basis for a new one. To compare, if you use the built-in functionality, it is necessary to copy and paste content manually to reuse a template. Another bonus of this specialized solution is a ready-made set of legal disclaimer templates, which are not available among standard Exchange set of options. 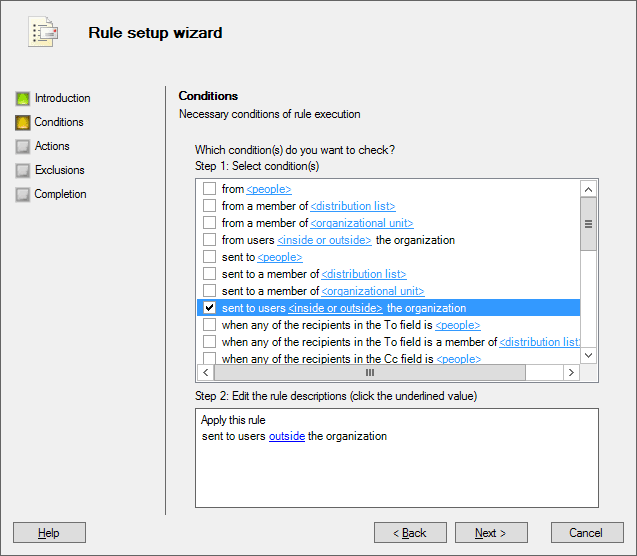 Third, the system of rules deserves some appreciation, too, as it enables to personalize disclaimers and signatures for every member of the organization through a flexible and thorough combination of actions, exceptions and conditions. Rules can be applied to individual users or to groups of users, assuring an utmost relevance of each signature. With Disclaimers for Exchange it has never been easier to keep your signatures up-to-date due to the use of dynamic content, such as phone numbers, addresses, job titles, and more. The product works in close integration with Active Directory, reflexing any changes made to the objects of the dynamic content in a signature. Next, deployment of the product is traditionally time-efficient and simple. The advanced installation wizard, which can be launched from any workstation in the domain, is responsible for server-side product deployment and for installation of the management console, which can be used both for rule set up and for overall performance monitoring purposes. 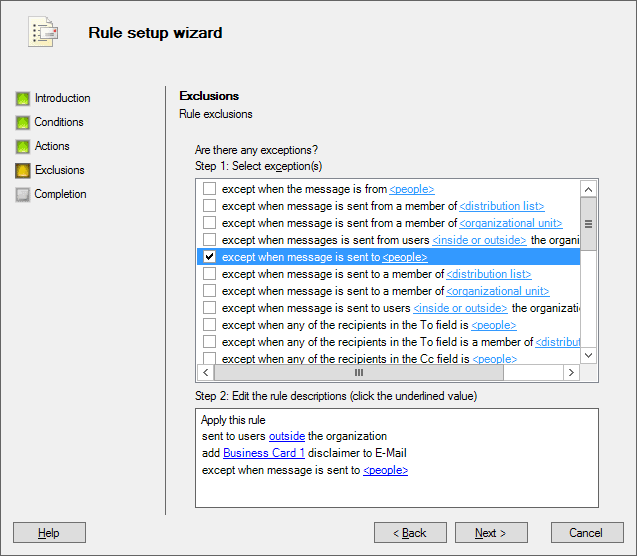 Depending on the license, you are entitled to choose a certain number of users whose messages will be processed by the solution. However, the number of servers where transport agents will be installed is unlimited, and so is the number of workstations where you choose to install the product components. 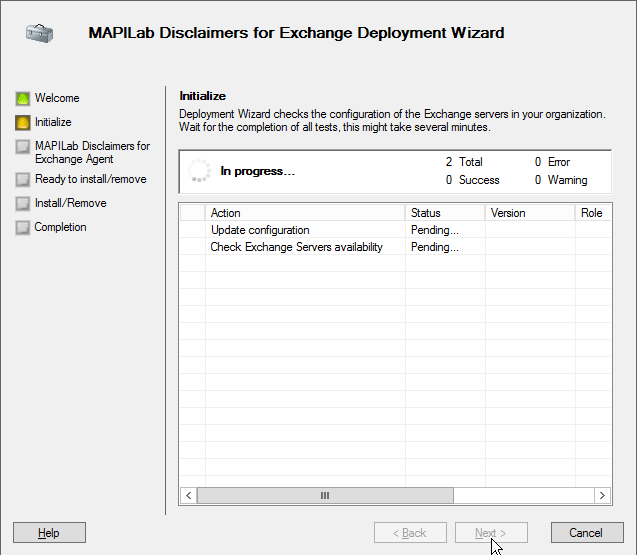 And last but not least, the MAPILab disclaimer solution for Exchange is not only compatible with multiple versions of Microsoft Exchange (from 2003 to 2013) and Microsoft Small Business Server 2011, but also ensures smooth functioning in mixed environments, which is a serious advantage over the built-in feature set. The latter differs from version to version; therefore, your disclaimers and signatures can look differently depending on which server processed the message. All things considered, MAPILab Disclaimers for Exchange is an indispensable tool for you if you want to add some shine to your business correspondence. This solution will make sure signatures, legal disclaimers, and disclosure statements included in your outgoing messages are relevant, up-to-date and unified in style and formatting. And this is a small, but not unimportant step towards your company’s good reputation.